Ocala, Florida is a small, somewhat rural town in the northern half of Florida, and home to a sizable horse breeding industry. It has also served as the location for several films, including the original Tarzan movies filmed in the 1930s and 1940s, and The Creature from the Black Lagoon. So unless you are a horse person, or are the curator of the Johnny Weissmuller museum, you may think you would have little business visiting Ocala. 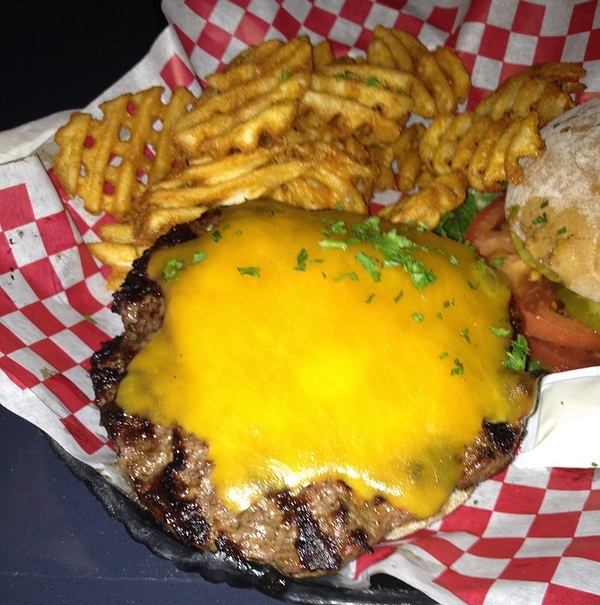 The Mojo Grill could be considered another reason to head to Ocala. It has been a standard waypoint anytime I drive up and down I-75 for several years now. A classic fat guy trap, the Mojo Grill serves up some of the best wings and sandwiches I've ever had. Recently, my concubine and I took our ritual detour to the Mojo Grill while on a road trip. She got her usual (Cuban, mojo sauce for dipping, side of grilled vegetables). I decided to inquire about the burger. Our server informed us that the meat is fresh-ground. Enough said. Game on. The Beef: Tasty. 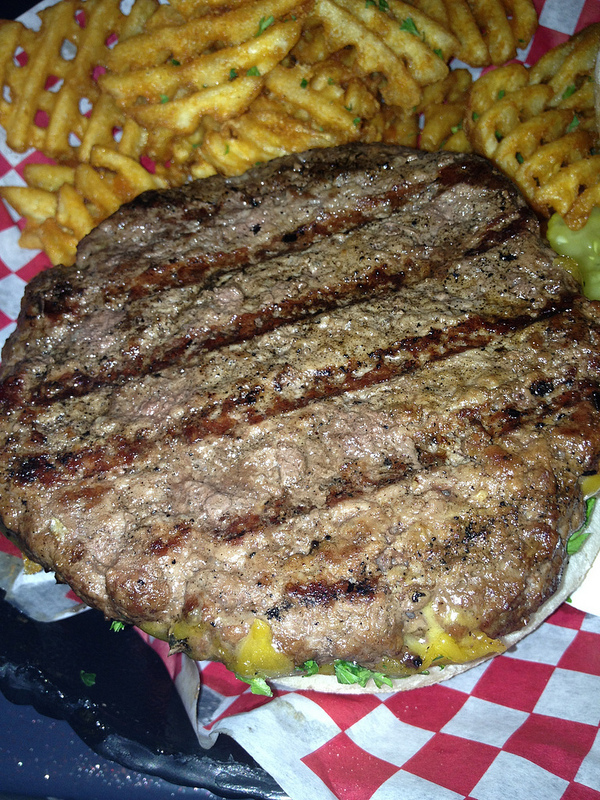 It was fresh-ground angus, cut unknown, hand-formed into a 10 ounce patty. The beef was full of the flavors I would expect from a good burger, with a slight funk from aging, and strong flavor of iron throughout the bite. It was not at all greasy, and fairly juicy. The Seasoning: The patty was salted and peppered appropriately. I also tasted a hint of some other seasoning, but it was so subtle I could not identify it. It was just enough to add a more interesting flavor profile to an already good burger. The Sear: The sear was fine, especially considering that it was flame-cooked. There were strong grill marks on the cheeseless side of the patty. The side that had the cheese actually had the more prominent sear, and the burger would have presented better had the cheese been reversed. There were some crispy bits on the edges of the patty that definitely added to the sandwich. The Preparation: The burger was cooked on an appropriately-warm gas grill, flipped once, to the Medium Rare that I specified. I was pleased. The Cheese: The burger was topped with a couple slices of Cheddar cheese. The top slice was melted well, the bottom, not quite as much. There was no sign of greasy runoff one normally sees with Cheddar, so that was one in the win column. The Bun: The burger was served on a rustic bun of unknown origin. It was a little dense, but tasted good, and held up very well with a big hunk of meat in the middle. The Meat to Bun Ratio: 1:1. The Fries: The Mojo Grill serves waffle fries. They were hot and crisp. However, I would recommend one of their other fine sides. There was nothing wrong with the fries, but their grilled vegetables are delicious, and their black beans and rice are great. The Toppings: The lettuce, tomato, and onion with which it was served were all fresh. The dill pickle chips were just fine. The Value: $9.29 for a 10 oz. cheeseburger and a side of fries. It's not making the front page of Cheap Eats magazine, but it's not an insult to your wallet, either. 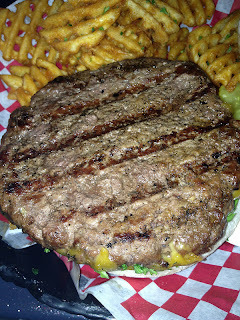 The beef was the star of the show with the Mojo Grill burger, as it should be. The only real misstep was that the cheese could have been melted a little better, and did not detract from the experience at all. I have eaten my way around their menu, and I find myself wishing I had tried the burger earlier. 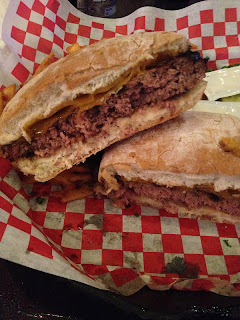 Burger Review: The Mojo Grill's burger is a good representative of the fine food they serve. Next time you go through, you should try the Bongo Burger! It's their Cuban with a burger patty mixed in. Absolutely my favorite meal to get at Mojo. Mojo's is my favorite restaurant! !